Wow, check out the demo. If you do cane magic or Dlite magic this is the effect for you. You can perform all of the miracles that can be performed with the dancing cane, including making it float around the body or dance to the beat. You will require a metal Appearing Cane (not supplied) to perform this effect properly. These are not coils! From a foot away you can?t tell it from a real wood pole. These Deluxe canes are better than the old style German models of years ago. Both are silver tipped, the Appearing has a spring-loaded lock release. All Cane Purchases Includes A Free Cane Book From Abbotts! 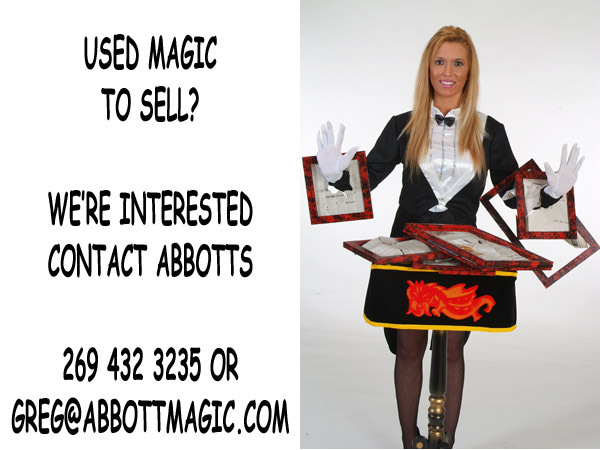 INCLUDES Magntic/TOP HAT Prior to the Vanishing effect, the performer changes the color of the Cane. Then, as a beautiful ending, the Cane Vanishes or changes into silks, streamers, bouquets, etc. Have the cane dance to music, swing, go around your hands or body or make it rise and swivel in mid air. 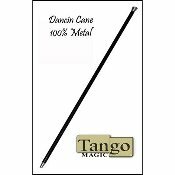 This is a sleek lightweight metal dancing cane, 32" in length.Black w/silver Tip. Unscrews in half for easy transportation, and comes complete with detailed illustrated instructions. Perfectly Balanced and extremely lightweight! An aluminum Cane floats from hand to hand, then around your body! The beautiful aluminum built cane is light weight and collapsible, and also includes a black cloth case for ease of storage and protection. A marker pen turns into a cane in the blink of an eye – but the effect on the audience is quite amazing! They jump out of their skin, look amazed, or fall into a fit of giggles! This cool effect brings the appearing cane bang up to date. Demo by past Get Together performer Keith Fields! 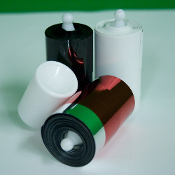 This material was developed and collected over a period of ten years. A most valuable collection. This is the most visible cane to silk you and your audiences will ever see. 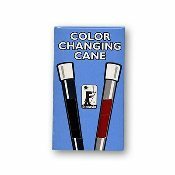 Imagine a cane which CHANGES 3 Colors! Then VANISHES! And CHANGES into silks, streamers, bouquets, etc. The performer begins with a black cane which he displays all around. Then he gives the cane a gentle shake and the entire cane changes color,... The Vanishing Cane a square modern tip.